The purpose of this manual is to acquaint new firefighters with the history, traditions, terminology, organization, and operation of the fire and emergency services. In addition, the manual contains typical job and operation descriptions that should provide insight into the inner workings of the fire service. 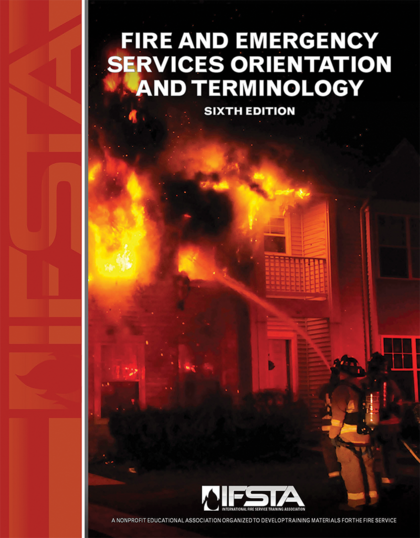 An extensive fire and emergency services glossary is included. The manual is also intended for college students who are beginning their associate’s level studies in fire related fields. The scope of this manual is to meet the learning outcomes of the National Fire Academy (NFA) Fire and Emergency Services Higher Education (FESHE) Principles of Emergency Services associate’s level course. In addition, information in this manual addresses numerous requisite knowledge items identified in Chapter 5, Fire Fighter I, and Chapter 6, Fire Fighter II, of NFPA® 1001, Standard for Fire Fighter Professional Qualifications. The manual is intended to be used in a college classroom, but is also an excellent companion text to IFSTA’s Essentials of Fire Fighting, 6th Edition and Essentials of Fire Fighting and Fire Department Operations, 6th Edition.